I know for many people, myself included, this book was a long time coming. And I'm happy to report that I not only thoroughly enjoyed this book, but I also think it might just be one of the most profoundly honest and raw examples of anxiety and OCD that I have ever read. 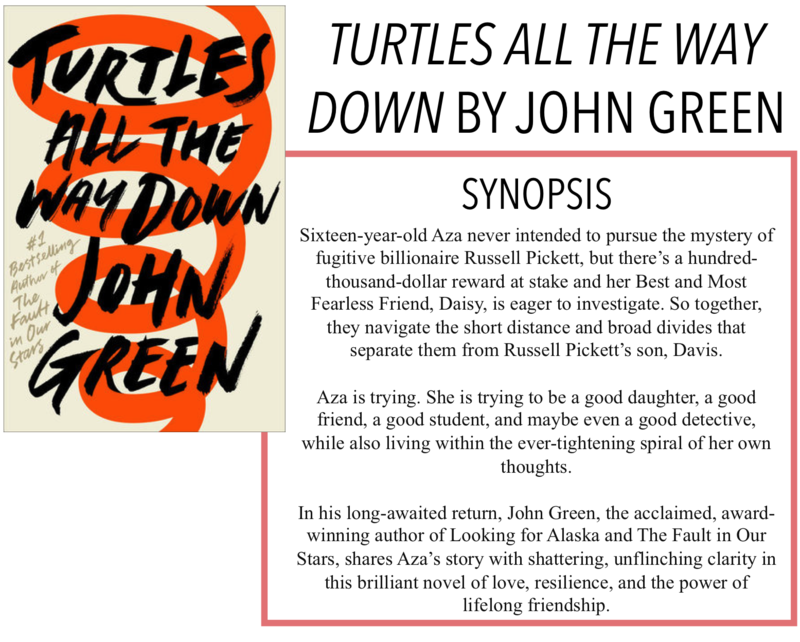 I am back with another book review, today it is the latest from John Green, Turtles All The Way Down. This story follows Aza, a teenager who finds herself in the middle of a missing billionaire investigation with her best friend, Daisy. She is reunited with her childhood friend, Davis, the son of the man who, presumably, skipped town mere hours before the police came to arrest him. In the midst of a rekindled relationship, Aza struggles to escape the spiraling of her thoughts. While I don't presume to know anything about the personal life of John Green, I do know a few things from watching his vlogbrothers videos. Most notably, his anxiety over the release of a book following the whirlwind that was The Fault in Our Stars. The release of this novel, I can only imagine, was extremely challenging and, while I know he's likely not reading this review and my opinion means very little, I just want to say that he absolutely hit it out of the park with this one. Even without knowing about Green's struggles with mental health, it is abundantly clear that he has an intimate knowledge of the issues he is addressing in this book. While I myself have been fortunate enough not to struggle with the mental health issues that Aza does, I have experienced it second-hand and up-close. Everyone's experiences are obviously different, but Green takes a look at anxiety and OCD that completely transcend the stereotypes and cliches. Sometimes it's not "did I wash my hands enough?" or "did I lock the door x number of times?" Sometimes anxiety manifests in a way similar to Aza, where you get so stuck in the spirals of your thoughts, even if you know they are irrational. While this book presents itself as a Nancy Drew-style Mystery of the Missing Billionaire, there is so much more to it than that. Even the romance is not really a romance, and definitely a step in the complete opposite direction of those in Green's previous books. I'm not sure if it's because of the female narrator, but the romances in this book are - different. They're not hard and fast and all-encompassing. They are doubtful and hesitant and real. It's not a girl trying to save a boy, just a girl trying to save herself, and a boy is along for the ride. What really stands out about this book is that it is so different from the other books Green has written. Part of me doesn't want to compare them, but the other part of me feels like I need to, because his books have created polarizing results. This book is John Green in the sense that there is quirky trivia, crazy friendships, and a million great quotes. But it's also not, in the sense that there isn't a sappy moment where the main characters have an amazing revelation. Aza just continues on in her life. Some may consider this boring, but I found it to be a refreshing change of pace from the books that try too hard to do something. Not much happens, but that's okay because we see an immersive and gritty portrayal of mental illness. Overall, a really important book that I would definitely recommend to everyone, regardless of their feelings on the author's previous books.